NFF has proudly brought to the Los Angeles-based social sector a range of creative thinking, empathy, funding, expertise, and partnerships to address the many facets and complex webs that build community strength and well-being. LA County is a study in contrasts. On one hand, it is experiencing robust economic growth, a boom in real estate development, and unemployment that is almost back down to pre-recession levels. On the other hand, it has approximately 50,000 homeless people and severe inequity, with immigrants and other marginalized groups suffering disproportionately across such measures of well-being as employment opportunities, educational attainment, and health outcomes. NFF’s work in Los Angeles illustrates the range of support we provide to organizations working on the local and regional levels to address inequities. As Alpha’s wife struggled with worsening alcoholism, he struggled to hold down a job while caring for their two sons, and the family spiraled into homelessness. 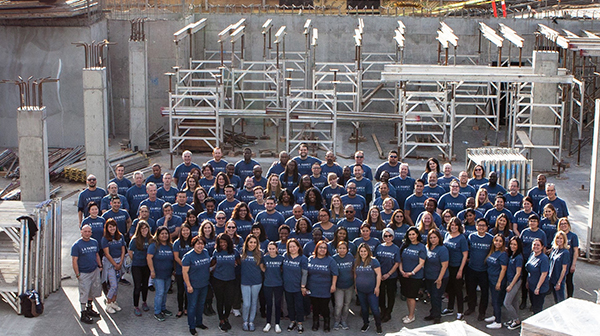 Then they found their way to LA Family Housing (LAFH), dedicated to helping people transition out of homelessness and poverty through a continuum of housing and supportive services. In 1983, LAFH had a 40-unit motel in North Hollywood where families could stay for up to 30 days. Today, it’s one of the largest providers of housing and homeless services in Los Angeles, and owns and operates 23 properties offering temporary, permanently affordable, and permanent supportive housing, with services that each year help more than 6,400 people move toward greater stability and self-sufficiency. This year, LAFH will open a new Campus centralizing its operations and those of community partners to provide LAFH clients and the public at large with employment services; housing assistance; legal aid, and medical, mental health, and dental care, all under one roof. Across a green space, 49 new units will be homes for chronically homeless adults. The 80,000-square-foot Campus was financed through Low Income Housing Tax Credits, New Markets Tax Credits, private foundations and individual donors, public grants, land contributions, debt, and sponsor equity. NFF, in collaboration with Dignity Health and Genesis LA Economic Growth Corporation, provided $8.35 million of loans. NFF loans have helped LA public and charter schools better serve California’s next generation. In 2012, a $12-million recovery loan helped Inner City Education Foundation, a network of 12 public schools in South LA, emerge from financial distress so its leadership could focus on long-term mission needs like upgrading facilities, improving student achievement, and implementing programs. The same year, NFF provided the charter school network Partnerships to Uplift Communities a $2-million line of credit for working capital and the acquisition and refinancing of two campuses housing five schools. In 2015, when PUC sought a financing partner to complete construction on three new school buildings in the Sylmar neighborhood, NFF’s $1.9-million loan helped ensure that more than 1,000 students were welcomed into 46 new classrooms, an auditorium, a kitchen, and playing fields. In 2014, NFF partnered with the Los Angeles County Arts Commission, Colburn Foundation, and The Herb Alpert Foundation to offer arts-capitalization workshops and one-on-one consulting to a group of their grantees. We helped increase the nonprofit leaders’ financial knowledge and their facility to communicate their cases for financial support, using NFF’s State of the Sector Survey and information from DataArts to help them understand and articulate the challenges facing arts organizations nationally and locally, and the ways these organizations can successfully strengthen their capital structures, strategic planning, and adaptable business models.